How to beat procrastination in your household time management is the focus of this week’s challenge. I’m not sure there is anyone out there who hasn’t suffered from this kind of underproductivity. Most of us are not procrastinators in all parts of our lives. I can say with near 100% certainty that there are certain areas, however, that you definitely struggle with; the “I’ll do it when I can/tomorrow/next week” mentality. In a baby step approach, I want to show you how to overcome procrastination with a real-life example in the field of household management. 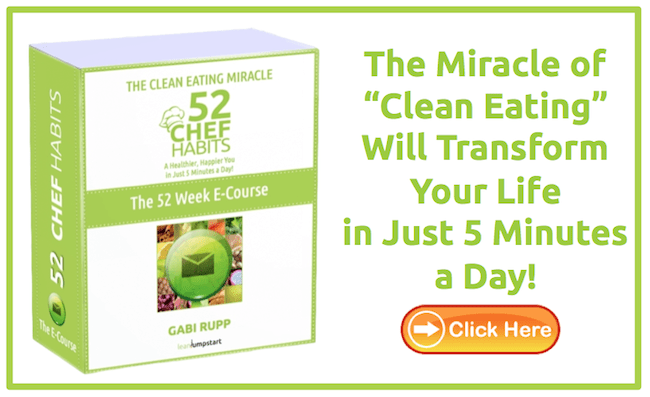 It is a tiny, yet essential habit that will complement and act as a catalyst for most of our 52-week clean eating routines. In this first baby step approach, I want to point out just one of many factors that trigger underproductivity. In my advanced approach, you’ll get more reasons for this unproductive habit where we will be taking an even harder look at what really stops us. Why should we beat procrastination? Obesity over the years has often been described as a disease of procrastination. Some fascinating statistics and studies by Piers Stell, one of the world’s foremost speakers and researchers on the science of procrastination and motivation, support this theory. During his ten year study that was released in 2007, he showed a close relationship between procrastinators and far-reaching personal problems. He found out that procrastinating makes us fatter, unhealthier and less wealthy. This shouldn’t surprise us – as mentioned before, the top two ways that people are distracted is through their television and their computers. The association between TV watching and the rise of obesity is a widely known fact. In a worst-case scenario, procrastination may carry over to other members of your family. If you missed my “let go TV” challenge from last week – then now would be a good time to combine both challenges. So I ask you: wouldn’t it be great if you wasted way less of your free time on low-value, sedative activities (watching TV, playing Farmville) and feel more in control of your time in general? The single most effective technique to overcome or avoid this unproductive habit is to convert long-term goals and big tasks into a series of the shorter term – but more precisely-defined – goals. Congratulations! 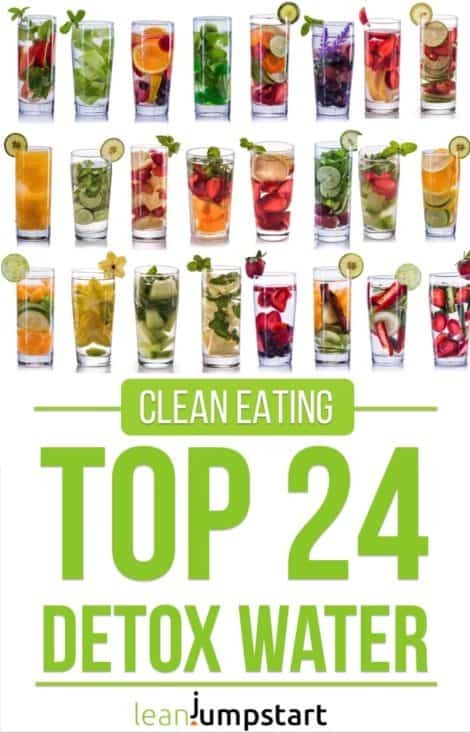 That’s exactly what you are doing right now by following and implementing the 52-week clean eating habits challenge. As you learn to achieve healthier habits each week and celebrate your achievement, you’ll gradually build a “success spiral” that in return increases your confidence. So, regarding your eating habits, you are already on a good path…But there is another important aspect in your life that could help you tackle those challenges even more successfully. Let’s look a bit closer into your household management and possible areas of underproductivity. The first room that comes into mind is, of course, the place that feeds your household – your kitchen! Is it a welcoming space organized in a way that makes food preparation easy and pleasant? Look around! Now, look a bit closer into the direction of your kitchen sink? What does it look like (especially when you get up in the morning)? Is it messy, piled with unwashed dishes? Or is it clean and shining? In which kitchen would you prefer to prepare a healthy meal? The fact is that in a chaotic kitchen, all too soon you’ll find yourself settling for the easy option – fast food! If you are serious about taking a healthier approach to life and losing weight, an organized kitchen is key to success. Is your kitchen most of the time uncluttered, well organized and clean? Then you can skip the following and dive instead into the advanced approach. For all others, I recommend doing my simple 4-step habit change. Within a few minutes, it can amend your kitchen, making it more comfortable and appropriate for you. 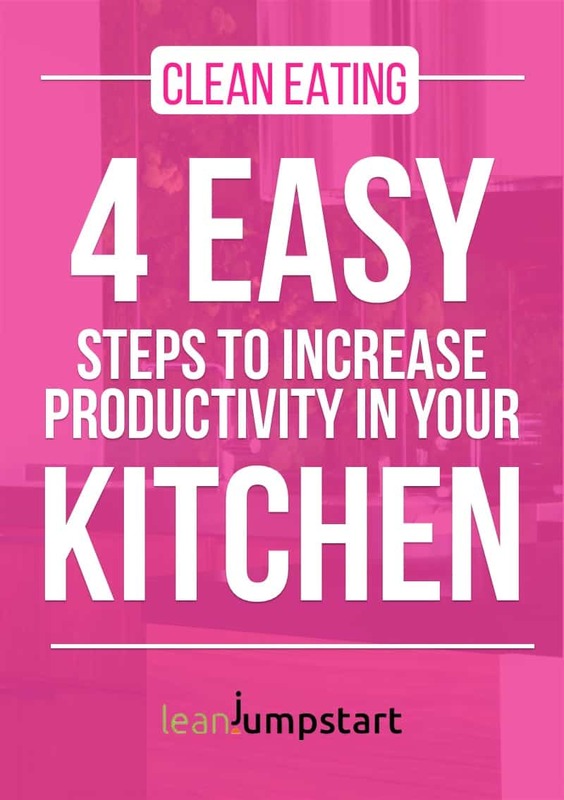 Let us stop procrastinating and get rid of the chaos in your kitchen one step at a time! Again, like in our past challenges, I will choose a small project. Once you complete the task, you can then tackle a more advanced one. 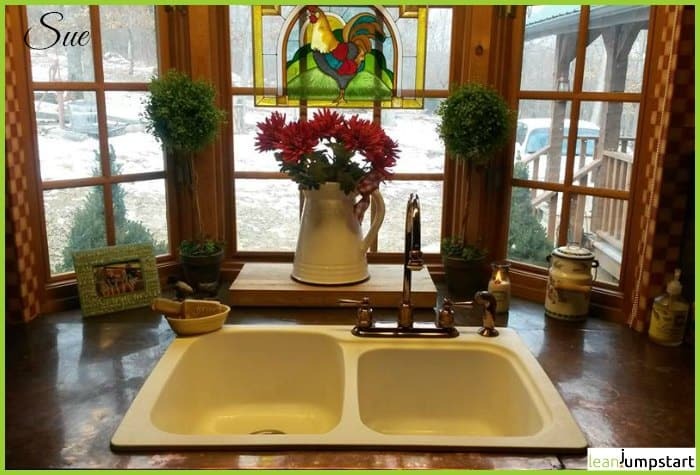 According to the queen of housekeeping Marla Cilley, better known as Flylady, it all starts with your kitchen sink. 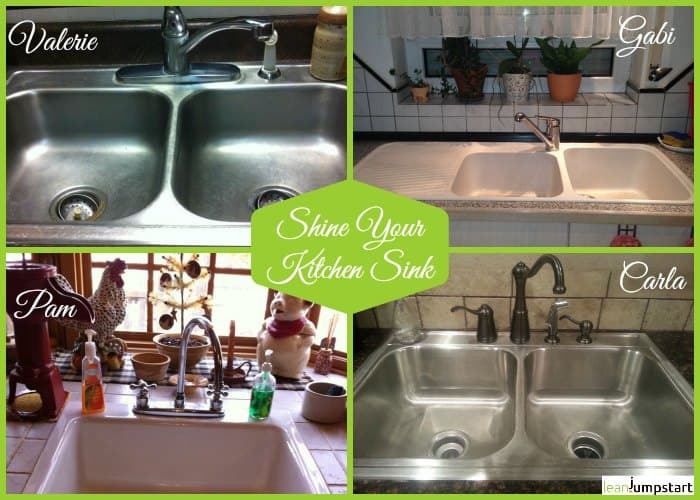 Her “shine your sink” concept is a great habit to begin! And you can do this too. She states that even in a chaotic kitchen, the cleaned-out sink delivers positive reinforcement to the person who cleaned it. This will give you an important sense of accomplishment. The process of cleaning and drying the sink should take you less than 5 or 10 minutes (depending on the size of your household). Decide upon a reasonable time for you to stop using the kitchen sink before going to bed. Step 3: Clean your sink with water and dish-soap using a non-scratch sponge. Rinse. Step 4: Spray the sides and faucet with cleaner and wipe everything dry. Dry the inside of the sink as well. With this easy 4-step habit change, your sink will greet you each morning and put a smile on your lovely face. Develop this little routine every night to completely clean your kitchen. Clean off the counters, load dirty dishes in the dishwasher, and swab and dry your sink until it’s shiny. Below I proudly present some clean and shining kitchen sinks from Carla, Pam, Valerie and me. Aren’t they beautiful? I hope they can inspire you! On a side note: If it is more than a month ago since you shined your sink, then I encourage you to follow Flylady’s one-hour procedure. She will give you some great advice on how to make your sink shine. You do not need to follow this method every day. Just keep up the shine each evening with the baby step approach above. Here comes another beautiful, clean kitchen sink by Sue! 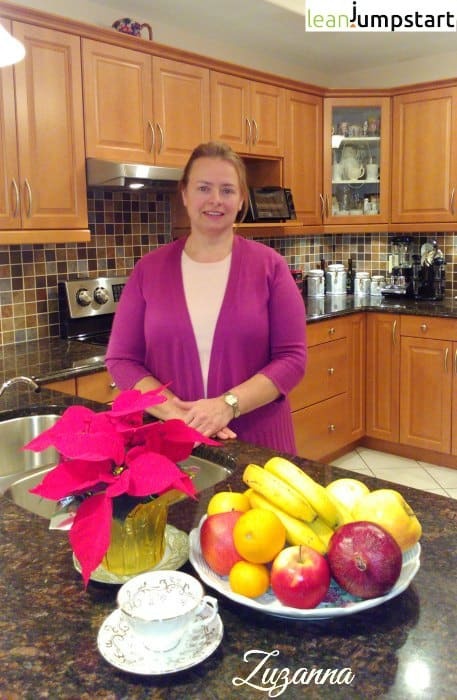 And here comes the lovely Zuzanna, who proudly presents her beautiful, cleaned up kitchen. Feel free to share your tips or questions in the comments section below! For the more ambitious readers, I have worked out an advanced approach where I explore the roots of procrastination and what we can do to make stuff happen. It is a gentle guide that will help you overcome this unproductive habit, no matter which area of your life it is affecting. But…and this one is important, it will also give you permission to stopping beating yourself up.